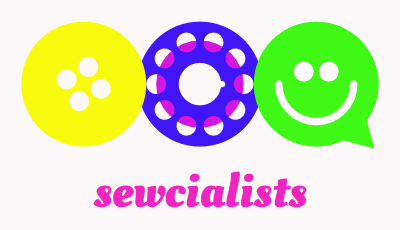 I've been doing a lot of sewing with knits. Part of it has to do with Me-Made-May and needing some basics quickly and The Monthly Stitch March Challenge of Sewing Knits. 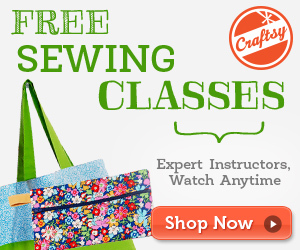 I've been getting some of my knits from the Craftsy class, Sewing With Knits (affiliate link). I've already written about the tee and the yoga pants. Here are two more, both were quick and easy. They are also quick and easy to wear. Comfy casual should be a clothing term. 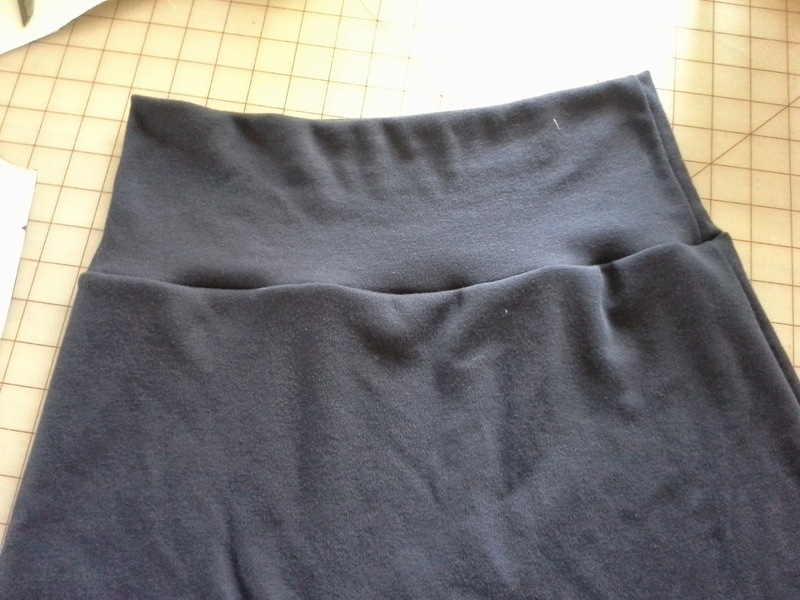 Sew side of waistband to make a loop. First is the skirt. It is a simple A-line skirt with a fold down waist. It uses the same wide waist band as the yoga pants. I made this out of the same navy interlock as the yoga pants. I'm pretty boring sometimes. 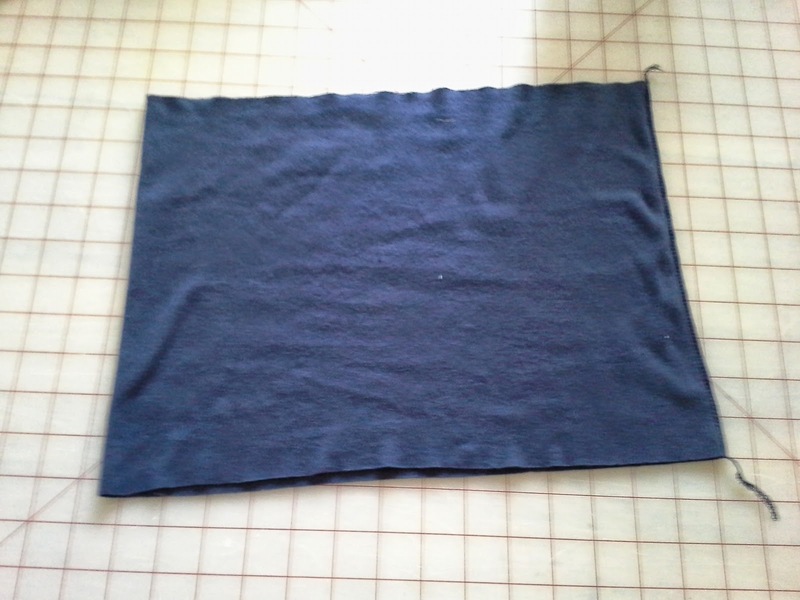 I will buy a basic fabric in a basic color in large quantities so that I can make several items from it. I find I have less waste and can often get an extra project from it. Waistband attached to the skirt. To wear, fold the waistband down. 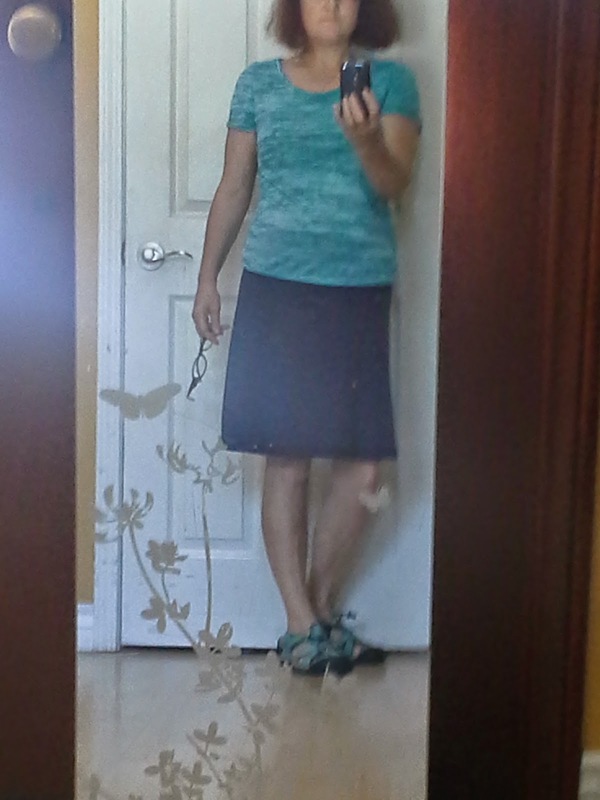 The A-line skirt is pretty easy. Sew the sides, sew the waist into a loop, fold the waist in half and sew the edges to the skirt and finish with a hem using a double needle. I used my serger so all the seams were finished as I went. I know I will make this skirt again. Most likely in a nicer fabric. This one was meant to be an alternative to pants in the mom uniform. I can make one up in less than thirty minutes, including changing thread and needles. Next is the pull-over hoody. It is meant to be made in a stretch fleece, but I knew with summer coming that I would be happy in a light jersey. I'm wearing it as a top rather than a jacket so the jersey is great. It does not have a kangaroo pocket, but it shouldn't be too difficult to make one. 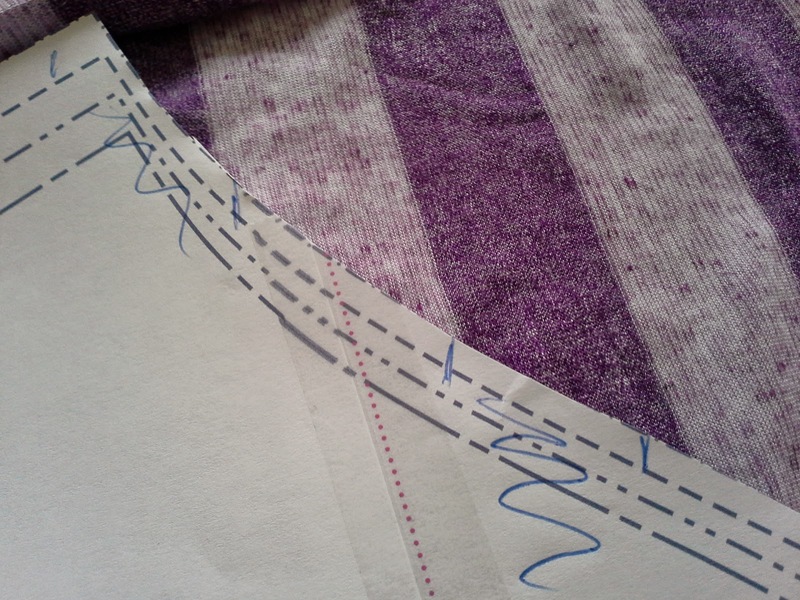 To match stripes, mark them on your pattern piece. This is the side seam and arm scye. I made this with a light jersey from my stash. I must have been in either a stripe mood or a purple mood when I bought this. 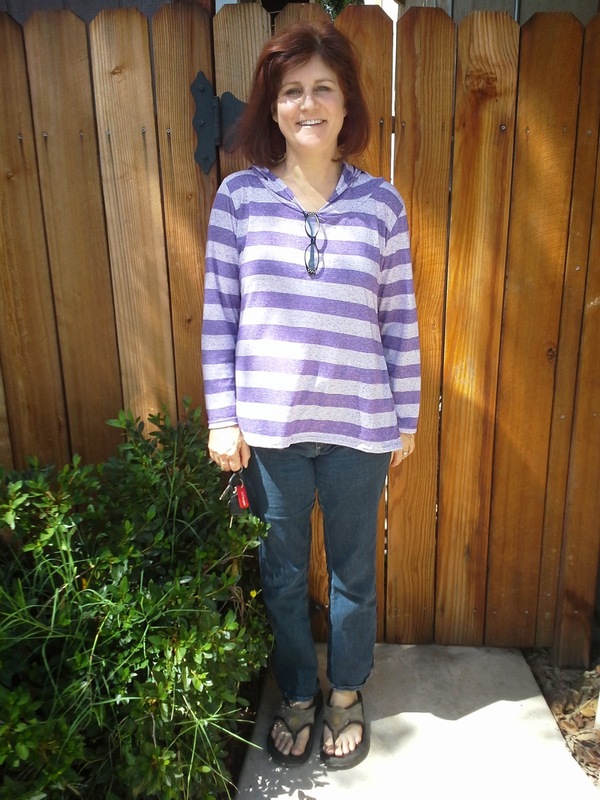 I had several striped fabrics and several purple. Some sewists are intimidated with stripes. 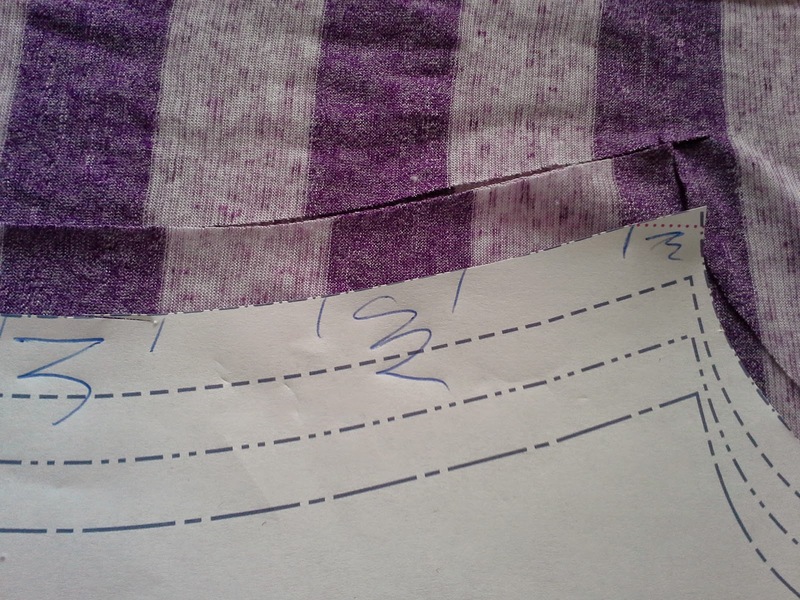 I have found that when sewing the body that marking on the pattern paper allows me to see what needs to be lined up. Normally, a pattern will have notches on the sleeve. I will use this to mark where my lines will match. This pattern did not have the notches, so I lined up a the armpit. It worked to line up the stripes, but normally, I would prefer to have them line up a little further up towards the sleeve cap. When lined up more towards the sleeve cap, it will match across the upper chest. If you can't match the front and the back, it is best match the front. The human eye looks at the face and this is closer to the face. Again, this was pretty quick. Sew the top of the hood and set it aside. Then sew the shoulders, sew the sleeve to the body, sew fronts and backs from the sleeve to the hem. Then sew the hood to the neck and use a double needle for the hems. 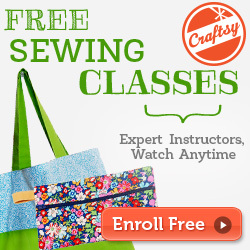 It takes less than 45 minutes using my serger for everything except for the double needle hem on the sewing machine. I love the hoodie and skirt, and your haircolor looks great!! I like the fact that you enjoy sewing stripes. My hubby had on a striped shirt today from an unnamed department store, and of course I go to check if the stripes lined up, and they did not! The things you do once you sew...I am not too surprised by RTW anymore. Thanks, Vanessa. I actually just made my hair darker since the photo, It was beginning to get too red. I use henna and indigo so I never quite know how vibrant it will be! I have gotten to the point that I don't want to buy ready to wear. It never fits right, it isn't in the right color or size and the workmanship isn't great. If I don't want it to fit or to have shoddy workmanship, I can do that myself! Ha, Ha! I had to laugh when you said you used henna/indigo, and never know how vibrant it will be. I used henna color last month and had the same result. I was going for auburn, but ended up with this purpley color. Needless to say, I ended up darkening mine too!! And yes, I don't miss most RTW either. Your hoodie turned out fantastic! Love the strips! I took this class when I first came back to sewing and made the hoodie out of fleece. I like it but I think your fabric choice was a lot better. Thanks Vicki. I really like hoodies. I don't use the hood, but it somehow effects how it hangs. I'm sorry the fleece didn't work well. I was hoping to make one for winter or camping. I know it may look sloppy, but I like having comfy clothes for hanging around. This looks like a great outfit to be running errands in or sewing....I want to sew a maxi knit skirt. I am the same way when it comes to fabric -- I buy a lot of something I like because you never know what project will come up next! I'm not sure if I'd run errands in this. Mostly, just driving the mom mobile and working around the house. Since you already have the pattern,I think this skirt could easily be a maxi by lengthening and having a firmer waist. This one is great on the skirt, but the same one on the pants is not so great.